Since the beginning of time people have been figuring out ways of protecting themselves and inventing tools and weapons for hunting as well as other survival purposes. In different ages, different weapons were invented as the people and world revolutionized. However, talking about dagger, it's the oldest weapon, yes, the dagger knife has been rooted back to Stone Age which was the earliest age of the world. First, it was made with stone, then bronze, copper, iron and so on. As this weapon became popular, people began to give it different shapes and sizes according to their needs. Not only the dagger has been used for hunting purposes but also for carving wood, in wars and combats for defense, and for early surgical purposes. Even now dagger is a great important weapon, by giving different shapes and sizes dagger knife is used for a variety of purposes. No matter how popular tactical daggers are, not all companies provide every sort of dagger to their customers. Knife Import has a huge collection of daggers that you can choose from. No matter what the usage is, you can always rely on their vast and intelligently sorted collection. To have the best self defense weapon with a safe customized sheath, you shouldn't look beyond this cool survival dagger. The total length of the dagger is 12 inches, made up of stainless steel the dagger gives a sassy look when you slide it in and out. The body and the tactical dagger is completely black in color, which can also act as camouflage if you want to stay low key in a fight or something similar. The dagger has a strong sheath for coverage that means you wouldn't have to worry about getting accidentally hurt while equipping yourself with MTech first recon survival knife. If you are a fan of Wolverine or X-men movies it will take you no time to recognize this X Claw dagger. Well, this piece among Knife Import's collection is the most fascinating one. This dagger is designed and manufactured in a way that provides the facility of not one but three tactical daggers at a time, enhancing functioning and increasing the efficiency of the task. As you might have observed, its design is depicted as claws. Are you afraid to step into life threatening danger? Just keep this dagger with yourself and the survival kit is packed! With its razor sharp tips and long shaped blade, X claw dagger will rip apart almost anything. If your task requires a heavy duty knife with some technicality then you already know what to choose, right? Well, here we have something clever yet amazingly efficient. The best thing about a boot knife is that you can easily hide it in your boot without letting the opponent know your next move. Additionally, in situations where you have no time to search for a weapon in your bag or luggage, pulling a dagger out of your boot will save a hell of trouble! Need something sassy? Boot knife with skull camo blade is the answer, need something smart and efficient for hunting and fishing? 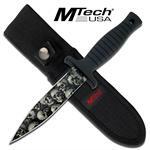 MTech boot knife is the best choice you can make for safety and self-defense. Have you ever seen something small that is marvelous at its job? Well, I am sure nothing beats the MTech USA fixed spear point blade push dagger knife. It's a push dagger that means you can push the handle to use its full length when needed. The blade of the dagger is wide which offers a wider cut in one shot, a razor sharp tip allows penetration in a single slit. The dagger has a black hard rubber grip handle which offers you a stronger grip. Specially crafted with silver and black stainless steel, the knife is surely long lasting. It is the best partner for adventure lovers and thrill enthusiasts, your adventures will even be safer if you are equipped with this fine knife. With an amazing collection of daggers at Knife Import, one can hardly resist. The collection has unique styles of cool daggers you have not seen before. So what are you waiting for guys? Grab one for yourself!